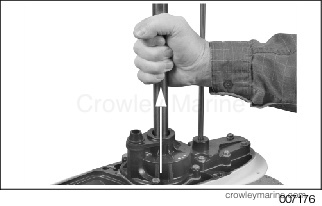 Use this instruction sheet when installing the above water pump kit on Evinrude® 115 and 130 HP outboard models, 2009 and newer. TO THE OWNER: Save these instructions in your owner’s kit. 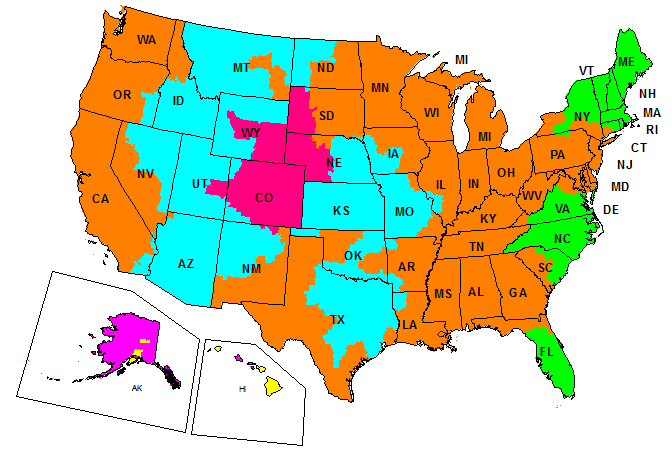 This sheet contains information important to the use and maintenance of your engine. Rotate the driveshaft counterclockwise to unlock the impeller key. Remove the four impeller housing screws. Slide the water pump off the driveshaft. 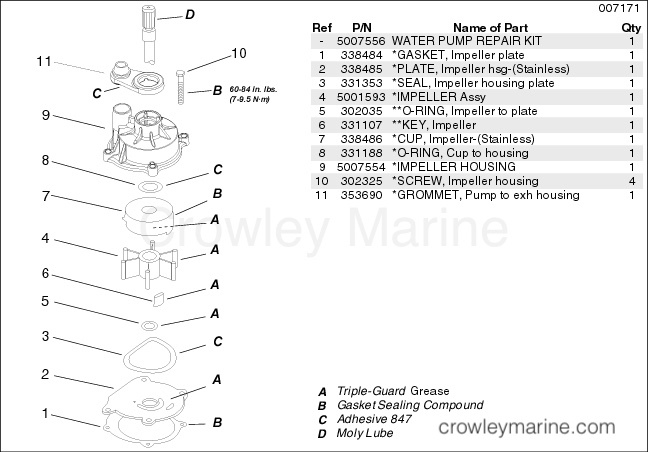 Remove the impeller key, O-ring, impeller plate, and gasket. Make sure gasket surface is clean and smooth. Apply a drop of Adhesive 847 in the seal ring groove at each of the four ribs. IMPORTANT: Do not allow any adhesive to get into the air bleed groove in the impeller housing. If this groove is blocked by adhesive, the pump will lose its prime and will not pump water. Install the O-ring in impeller housing groove. Lightly coat the exterior of the impeller cup with Gasket Sealing Compound. Install the cup in the impeller housing. Make sure vent hole in impeller cup is open. 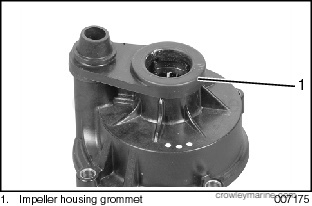 Apply Adhesive 847 to flat side of the impeller housing grommet. Install the grommet, flat side down. Lightly coat the liner with Triple-Guard grease. 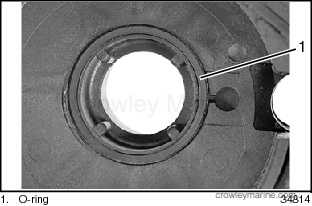 With a counterclockwise rotation, install the impeller into the liner with slot for impeller key facing out. Apply a thin bead of Adhesive 847 in the seal groove, and install the special shaped O-ring seal. 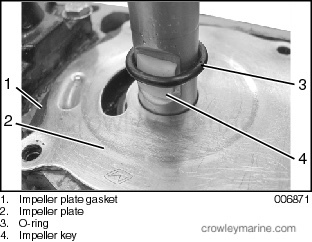 Apply Gasket Sealing Compound to both sides of a new impeller plate gasket. Install the gasket and impeller plate. Apply Triple-Guard grease to a new impeller O-ring. Slide the O-ring down the driveshaft and half way over installed impeller key to temporarily hold key in place. The sharp edge of the key is the leading edge in clockwise rotation. Slide the water pump down the driveshaft. Align impeller slot with the impeller key. 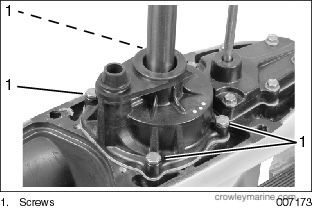 Rotate the driveshaft to engage the key with the impeller, and slide water pump down over key. Be sure impeller key does not fall out of position. IMPORTANT: Make sure the impeller engages the impeller key. Serious powerhead damage will result if impeller key is not in place. Align the impeller housing with the gearcase. Apply Gasket Sealing Compound to threads of the four impeller housing screws. Tighten the screws to a torque of 60 to 84 in. lbs. (7 to 9.5 N·m). 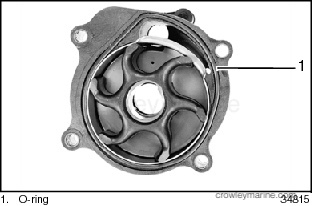 After water pump is assembled completely, rotate driveshaft counter clockwise 1/4 turn to unlock and release impeller and key from driveshaft. 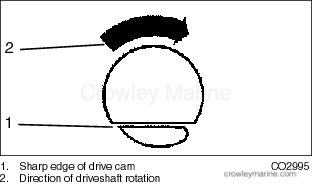 Next, pull up on driveshaft and turn clockwise to lock impeller to shaft. 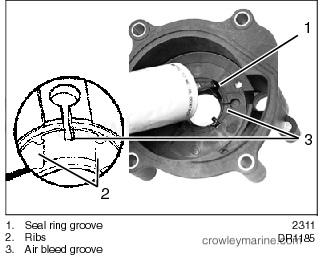 This process increases pump efficiency by locking the impeller in a lower position on the driveshaft. IMPORTANT: Before installing gearcase, shift rod adjustment MUST be checked. Refer to appropriate Service Manual. 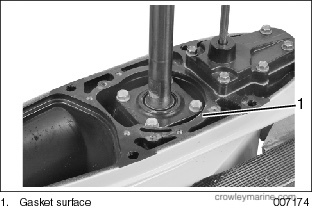 Failure to properly tighten all gearcase retaining screws can result in gearcase loss and loss of boat control at high speed. Start outboard to check water pump operation.